The hats are made from high quality, locally made, straw plait and show a range of plait types. The plaits are hand-stitched together into various different hat styles. All hats are lined with white silk and interlined with tissue paper; some hat brims have a wire support. All hats were made by Taylor Brothers and exhibited at ‘the Great Paris Exhibition’ in 1878. It is of interest to see the hats as they were when exhibited in Paris, in their pre-trimmed state and never worn. Make the plaits, interlinings and linings safe for occasional display, long term storage and study purposes. Condition poor; failed construction stitching caused the plaited straw structure to uncoil; silk and paper elements were extremely degraded and creased. Following surface cleaning and humidification treatment, each unravelling straw plait coil was re-aligned and secured to the adjacent overlapping plait with a conservation-grade, cellulose based adhesive. Creasing was removed from the paper interlinings and silk linings with humidification treatments. Each lining was fully supported onto silk crepeline; the support fabric, which had been pre-cast with a cellulose based adhesive, was attached to the lining by solvent re-activation of the adhesive layer. Each conserved hat was supported on a padded tray with padded support form. The padded tray minimises handling and provides support during storage and study. Each hat is considerably less vulnerable; well supported on mount; well protected in storage box. Designed to reduce handling of the hats and immobilise them in the storage box. The bonnet is part of the collection at Wardown House, Museum and Gallery. 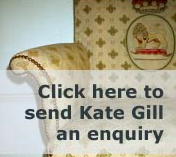 Reproduced courtesy of Luton Culture; Kate Gill Textile and Upholstery Conservation Services © 2019.